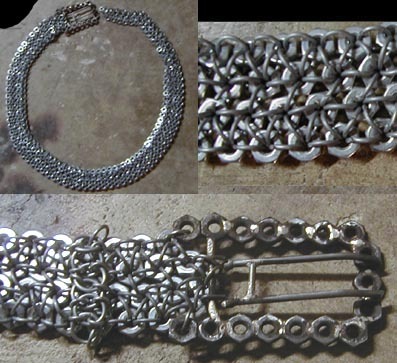 This belt is made out of 10-32 hex nuts and 1/4id links. It took almost 400 nuts to make. The clasp was made out of nuts and a tad of silver (im out of solder, but i guess solder would be silver too). This was given to a friend at the place i used to work. Many thank you's to her for being such a good advertiser and cool person. Hurray for giving.